Do you have a child who doesn’t know how to repeat what you say? Do you get blank stares when you tell a child, “Say ____,” ? Imitation is the core skill that many late talkers, regardless of their official diagnosis, haven’t yet mastered. As SLPs who work in early intervention and preschool programs, teaching verbal imitation is where our treatment plans usually begin. We jump right into treatment by ‘following a child’s lead’ during sessions and narrating play with single words in hopes of jumpstarting expressive language. We advise parents to model functional vocabulary words during daily routines so that the child will begin to repeat those words. If it were really that easy, would that kid be on your caseload in the first place? As a parent, you may be surprised or confused when your toddler doesn’t respond as you coax them to try to say words. Imitation emerges very, very early in typical development and often occurs without direct teaching. Many times parents are teaching a baby through imitation without being consciously aware of the process. An infant’s earliest social and communicative interactions consist of looking at his mother and instinctively copying her facial expressions and vocalizations. The mother hears her sweet baby’s coos and repeats those sounds. The child responds by moving his arms and legs and vocalizing even more. During these back and forth gazes and early ‘conversations,’ an infant, only a few months old, begins a life-long process of imitating another person. In the second six months of life, this process evolves as a baby begins to imitate her parent’s actions with objects. A parent shows a child how to stack blocks or operate the new Busy Box. Actions begin to look more like communication when a child copies a parent’s movements in early social games like Patty Cake and Peek-a-boo. Contrary to what we may have been taught, teaching imitation first begins with teaching a child to imitate actions, not words, during play. For many of the children we see, this serves a dual benefit of helping them learn how to play. Just beyond actions, we move on to helping a child learn to imitate other kinds of body movements and gestures that become communicative. Even then many late talking toddlers aren’t yet ready to begin to imitate single words. The child may need to learn several ‘in-between’ steps before he’s ready to begin to imitate single words. 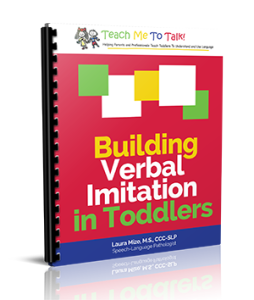 Learning how to imitate mouth movements, early vocalizations like fake coughing and sneezing, play sounds like blowing raspberries and animal sounds, and easy exclamatory words such as “Wow!” should dominate our early sessions with late talking toddlers. Many times parents and therapists don’t see success with late talking toddlers because we’re not working on the right things. Changing our approach to target imitation in its earliest and easiest forms is the place to begin. In this 180 page therapy manual Laura Mize, pediatric speech-language pathologist and founder of www.teachmetotalk.com, explains the hierarchy of verbal imitation skills she teaches to therapists throughout the country. This simple, straight-forward approach is easy for both parents and therapists to understand and implement during familiar play-based activities and daily routines. Laura’s method delivers a framework for knowing where to begin work with a late talking child, provides ideas for what to try when a young child’s progress stalls, and can serve as your new approach when your standard methods don’t seem to be adequate for a particular child’s issues. A detailed description for each level so you’ll know exactly what to do to teach the new skill. The rationale is presented so that you’ll understand why you’re working on each skill and how the skill relates to overall speech-language development. This information is critical for parents to understand as they work with a child, but often SLPs and developmental interventionists aren’t exactly sure how to explain what we do so that parents are able to carry-over those successes. Laura’s practical style will fill in that gap so that you’ll know what to say and how to teach parents to follow-through at home. A chart is provided for each level with many, many examples of the skills to target with a young child to move him along to words. There’s no guessing! You’ll know exactly what to work on with a child to address each new level. Each chart is a great tool for therapists to copy for parents & caregivers to reinforce what you’re working on during visits and for “homework” between sessions. Each chapter includes a list of time-tested and toddler approved materials to use during play and during daily routines for each level. All activities are appropriate for use during therapy sessions in a clinic setting or during home visits with parents and siblings. Specific ‘how to’ instructions for eliciting each skill are included for each level. This information is especially helpful for parents, for therapists who are new to early intervention and have limited treatment experience with late talking toddlers, and for experienced therapists who want to expand their repertoire of proven treatment strategies for young children with speech-language delays. Troubleshooting tips for additional ideas are listed at the end of each chapter. There’s no more second guessing why a child isn’t making progress. You’ll receive specific instruction for what to try if you’re not seeing results, and the next steps are outlined so that you can move a child forward. A handy, one page quick reference chart is included at the end of the manual. This is particularly suited for therapists to use as a ‘cheat sheet’ during sessions or to provide for parents as an overall guide for treatment. Because young children learn best during play, Laura provides specific examples for using this approach with the following five common toys toddlers love: bubbles, farm animals, baby dolls, Potato Heads, and cars and trucks. Additionally, Laura lists specific recommendations for using this approach at home for several daily routines including meals/snacks, bath time, dressing/diaper changes, reading books, and playing in the kitchen. If you’re a speech-language pathologist or developmental therapist looking for ideas to teach parents to use to incorporate language learning, then this is the resource for you! All charts and activity pages can be copied to share with parents as ‘homework’ for between sessions. This resource is INVALUABLE for therapists who work in programs embracing a ‘no toy bag’ or consultative approach. Not only will you receive many, many practical ideas, but you’ll have plenty of written ‘how to’ directions to share with parents in an easy-to-understand format. PayPal customers can easily order with PayPal Express through our online store. Click the link above to order. Its been 6 months I was reading and applying the things you have said in verbal imitation book. This book is awesome. It was a perfect start for my son’s mouth movements. At first its not working but I kept trying cause I had no other options. Then now after 6 months my son changed from non-verbal to verbal. He has moderate to severe apraxia, mild autism now he immitates with us. We coupled this book with exercise like swimming, jumping 200 times, swinging and heavy muscle excercise like crawling through tunnel. He even started to say 2-3 sentence. Now we are working on approximation. He is unable to say BEE, PEA word he says “TEE” instead. I would really appreciate if you could give me some tips on how will I help him for this mouth movement. Thank you.